self check in/out was very easy. great location and lots of parking. funky and unique room but starting to show definite signs of wear. enjoyable. 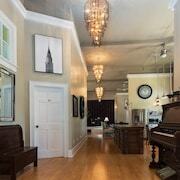 Beautiful heritage home. Large rooms. Plenty of towels etc. in bathrooms. Excellant full breakfast with many choices of items.Within walking distance of everthing in downtown Brockville. Where to find Johnstown hotels near an airport? Where can I find hotels in Johnstown that are near tourist attractions? 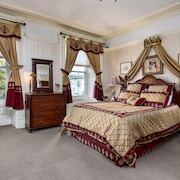 If you plan to book a hotel near the heart of Johnstown, there is a limited range of options. The middle of Johnstown offers 3 Expedia-listed accommodations within a 0.1-kilometre (0.06-mile) distance. 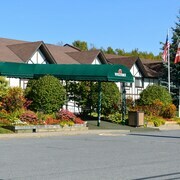 If you want to stay within 5 kilometres (3 miles) from the middle of Johnstown, the The Colonel's Inn is a good hotel. 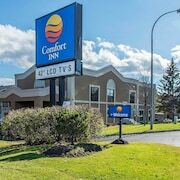 The Holiday Inn Express Hotel & Suites Brockville can be found 25 kilometres (16 miles) from the heart of Johnstown. Alternatively, the The Stonefence Resort is located 9 kilometres (6 miles) away. 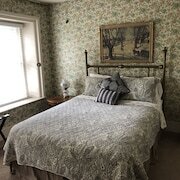 The Quality Inn Gran-View as well as the Comfort Inn Brockville are two other recommended accommodation options worth checking out in Johnstown. Once you have spent time in Johnstown, why not travel a bit further afield? The Ottawa - Southeastern Ontario district has many things to offer tourists. If you love nature, be sure to explore Ottawa - Southeastern Ontario's forests, rivers, streams and lakes. You should also visit a selection of its old towns, art museums and nature museums. Visitors in this region of Canada commonly enjoy cross-country skiing, snow shoeing and snowmobiling. Why not spend a few hours enjoying Brockville Railroad Tunnel South Entrance and Brockville Arts Centre, in Brockville, 25 kilometres (15 miles) to the southwest of Johnstown. 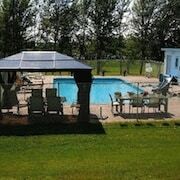 If you'd like to spend a night or two in Brockville, check out the Days Inn - Brockville and Travelodge Brockville. Or, you could stay in Perth, 65 kilometres (40 miles) to the west of Johnstown, where you'll find the Best Western Plus Perth Parkside Inn & Spa and Aquarius Motel. Whether you're just passing through or staying in Perth, a couple of places to add to your itinerary are the Perth Museum and Conlon Farm. Get your sports fix by taking a journey to Canadian Tire Centre, which is 70 kilometres (44 miles) to the northwest of Johnstown. Book a hotel near the action at the Holiday Inn Hotel & Suites Ottawa Kanata or the Fairfield Inn & Suites by Marriott Ottawa Kanata. Before you make tracks to Johnstown, why not visit our Johnstown travel guide where you'll explore the numerous cultural and scenic attractions this great place offers. What are the most popular Johnstown hotels? Are there hotels in other cities near Johnstown? What other types of accommodations are available in Johnstown? Explore Johnstown with Expedia.ca’s Travel Guides to find the best flights, cars, holiday packages and more!